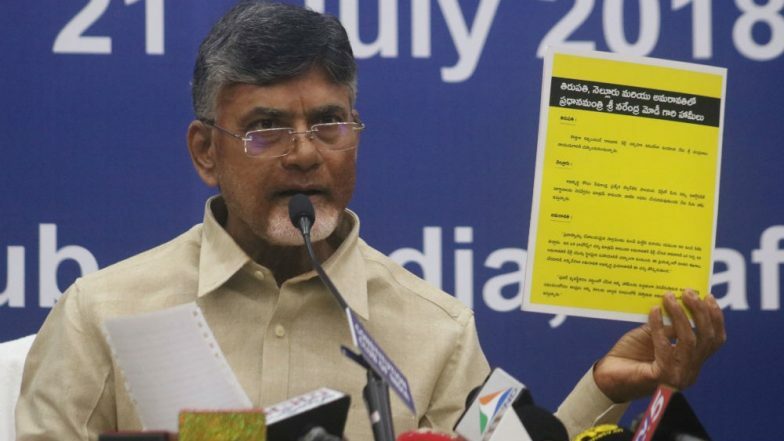 New Delhi, April 14: The Election Commission on Saturday wrote to the Telugu Desam Party (TDP) asking how a person with criminal records could be a part of a delegation led by its Andhra Pradesh Chief Minister N Chandrababu Naidu during his visit to the poll panel. The EC in its letter mentioned that when Naidu visited, he was accompanied by one Hari Prasad who repeatedly raised various technical issues regarding the functioning of EVMs. When the TDP delegation arrived at 4 pm to meet deputy election commissioner Sudeep Jain and Prof Emeritus Emeritus at IIT D T Shahani, the EC recognised Prasad. So after he turned for the meeting, the poll panel brought up his criminal past and raised protests. The EC then wrote a letter the president of TDP legal cell raising questions about the inclusion of Prasad into the TDP expert committee. Prasad was arrested in 2010 for illegally procuring an EVM but later was released on bail. Andhra Pradesh Lok Sabha Elections 2019: Phase I Voting Concludes, Over 66 Percent Voters Exercise Franchise. Meanwhile, replying to the Commission’s letter on Sunday, The TDP expressed strong reservation about EC's approach towards its technology advisor on the ground that he was involved in the alleged theft. The party said that the on many occasions in the past Prasad had attended sessions on EVMs. The party also alleged that the Election Commission was trying to avoid the EVM issue by raising questions on Prasad’s inclusion in the expert committee formed by the TDP. The TDP also pointed out that Prasad is first Indian to be honoured with EFF Pioneer Award 2010 by the Electronic Frontier Foundation (US). The Andhra Pradesh’s ruling party added, "He attended the meeting a.s part of Chandrababu Naidu's delegation in the capacity of technology advisor to Naidu. He presented a discrepancy in VVPAT machines before CEC and his team which is very serious in nature.”Andhra Pradesh Lok Sabha, Assembly Elections 2019: EVM Glitches Reported, CM Chandrababu Naidu Demands Ballots Papers. On Saturday, Naidu visited the EC office in New Delhi to complain about the malfunctioning of EVMs during the first phase of polling in the state on April 11. A day after polling for all the 25 Lok Sabha seats in Andhra Pradesh, which was marred by the malfunctioning of some EVMs, Naidu on Friday blasted the EC for what he called "turning the elections into a big farce".